American author Ernestine Ulmer said, “Life is uncertain. Eat dessert first!” If we accept her advice, we should start by making blueberries the theme for a special day with a muffin that is light, fluffy and blueberry-filled. Or, why not have blueberry pancakes for breakfast? Blend a blueberry smoothie for lunch with your favorite protein powder. Serve blueberry scones at teatime. Finish the day with a warm blueberry cobbler, topped with ice cream. You’ll have an entire day packed with the power of natural antioxidants. Fresh fruit is now in season and it’s the perfect time to enjoy cherries, berries, apricots and mangos, to name just a few. Fruit can easily be added to some of your favorite dishes, starting with breakfast. It can be put into a salad for lunch, or sprinkled on top of your protein choice for dinner. Could anything be more delicious, or look more refreshing than when fruit is added to a favorite dessert? It quickly adds color, texture and nutrients to any meal. Strawberry shortcake is a classic dessert that is made with a traditional biscuit-like cake, pound cake or angel food cake, but topping with real whipped cream is a must. Strawberry and rhubarb are a combination that makes quite an appealing pie or pudding. Entertaining? 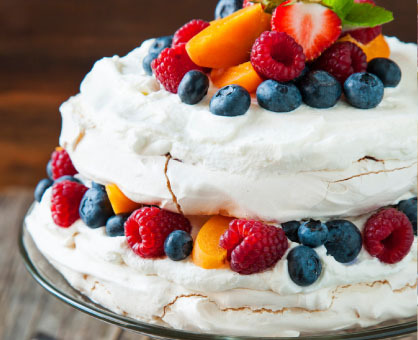 A mixed berry pavlova is certain to impress your guests. It is not difficult, just a baked meringue topped with berry sauce. Celebrate the season with fruit punch served with a few berries in each glass; you’ll be sure to please everyone’s palate. Some of our favorite fruits to eat out-of-hand belong to the stone fruit family (those with a pit in the center). They can simply be sliced, and combined with an assortment of cheeses and nuts for a quick and easy dessert tray. The sweet flavor of mangos and peaches is evident when chopped into salsas or sliced into a salad. No matter which you select, all fruit provides essential vitamins for your health.